I was born and brought up in Hyderabad. I had been learning piano and violin since childhood. I was also trained in Carnatic singing and used to sing Ghazals in All India Radio when I was a kid. After completing my fifth standard, I got admission into Trinity College of Music in London. I completed the 8 years music course from that esteemed music university. I completed music course in 2002 and I had been working on my music and practicing it for years. I grew up listening to the music of AR Rehman. I got addicted to film music because of AR Rehman. I decided to take up the job of a music director for Telugu films. I approached Tammareddy Bharadwaja and he gave me a chance to compose music for his 'Pothe Poni'. After that I worked for 10th Class and Notebook. I met Sekhar Kammula after the release of Dollar dreams. And our combination got finalized for Happy Days. Tell us about Happy Days music? The project started in January 2007. 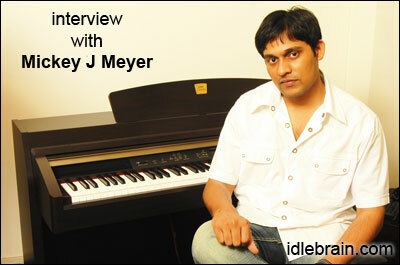 I had to compose lots of tunes for each song to impress Sekhar Kammula. It is easy to work with Sekhar Kammula as our wavelength matches. Happy Days music is very close to my heart. It will be surely heart touching and nostalgic. The script of the film is very good and it inspired me to come up with fine music. Sekhar has given me lot of freedom. I got musicians from Singapore, New York, Hyderabad and Chennai to work for this album. The sounds used in this album are very different from what we hear in regular films. There is western influence in these songs and instruments like piano and guitar strings dominate the music. The title song of the film has rock background. Are you also doing background music for Happy Days? I composed only songs for my first three films. I am doing both songs and background music for Happy Days. Which one is easy, composing songs or doing background music? Both are equally important for any film. But composing background music is difficult. It would become more challenging to do background music for good scenes. What is your favorite album and favorite song? I am a great fan of AR Rehman. My favorite album is Vandemataram (AR Rehman) and favorite song is Tu Hi Re (Bombay film). Which are your favorite songs in your own films? Arere (Happy Days) and Nemaha (10th class). Tell us about Trinity college of music? They teach western classical music in a systematic method using notations for eight years each grade every year. In order to have expertise in music composing, one should have thorough knowledge in western classical notations. It will be very helpful in BGM. Music directors like Harris Jayaraj and Yuan Shankar Raja graduated from this college. Ilayaraja completed his doctorate in this music college. We are also trained to compose music using live orchestra where we pen the notations and distribute among the musicians and let the conductor organize the music in synchronization with the musicians. In Hollywood, everything in music is done using notations. How important is music college education for a music director? AR Rehman gone to the stage of composing songs for UNO and Hollywood films like Lord of the Rings. If we learn the music from the foundation level in music colleges, it shows in our work. And longevity is guaranteed as music schools teach us all aspects and hone our skills to give different music as per the genre of the films. I am completely focused on doing the background music for Happy Days now. I am waiting for the release of Happy Days before committing my next project.